(A selection): 1.ELECTRICAL EQUIPMENT AND POWER SUPPLY SYSTEMS FOR MINES. Mine power supply. Reliability of supply. Voltage selection. (2 papers). High-voltage pit plants. (3 papers). Standard high-voltage switching panels. (3 papers). Supply and location of pit substations. (2 papers). Pit substations. (5 papers). Low-voltage switching and distribution systems. Standard low-voltage distribution networks. (6 papers). Low-voltage mine network. Reactive power compensation. (2 papers). Trolley system. Mine lighting. Pit lighting. (5 papers). Lighting of opencast mines. (2 papers). Signalling and communications. (4 papers). 2. ELECTRIC MOTOR DRIVES. Electromechanical characteristics. (2 papers). Types of electric motor drives with respect to electric motor types. (1 paper). Synchronous motor drives. (2 papers). D.c. motor drives. (3 papers). Regulated electric motor drives. (1 paper). D.c. motors. (2 papers). Control and automatic control of mining operations. (3 papers). 3. ELECTRIC POWER CONSUMPTION IN MAIN PARTS OF THE MINE. General. Hoists. Main ventilation fans. Compressors. (2 papers). Drainage. Car transportation (trolley network). Continuous transportation. (2 papers). District consumption. Power consumption of an underground mining operation. Power consumption of an opencast mine. 4. PROTECTION FROM NETWORK-RELATED AND OTHER ELECTRICAL PHENOMENA IN MINES. General. Current overload. Heating caused by current loads. (4 papers). Overload protection. (2 papers). Earth fault and hazardous fault voltage protection. Earth faults in the network. (3 papers). Physiological effects of electric current on the human body. Boundary hazard conditions. (2 papers). Direct and indirect contact. Degree of electrical insulation. Earthing and potential equalization. Network protection systems. (1 paper). Protection in earthed systems. (4 papers). Residual current protection in impedance earthed networks - IT[Z] network systems. Protection in non-earthed neutral point of power supply systems. (3 papers). Additional insulation. Types of earthing arrangements. (2 papers). Short circuits. (4 papers). Short circuit protection. (4 papers) . Voltage drop. (1 paper). Voltage drop calculation (2 papers). Calculation of power and energy losses in mine networks. Motor drive voltage drop. Permissible voltage drop. (2 papers). Voltage drop and voltage changes in the network. Motor protection from uncontrolled voltage build-ups and excessively low voltage. Atmospheric discharge. (1 paper). Transmission of electromagnetic energy through pit roadways. (2 papers). Electrostatic charges occurring in underground mining operations. (2 papers). Potential hazards due to electrostatic charges in mines. (4 papers). Protection from electrostatic charges. Stray currents in underground mines. 5. EXPLOSION-PROTECTED ELECTRICAL APPARATUS FOR MINES. Explosive and flammable mixtures. (4 papers). Physical characteristics of explosions. (6 papers). Explosion flame transmission. (3 papers). Classification of flammable gases, liquids and dusts, and electrical equipment. (4 papers). Classification of areas endangered by explosive atmospheres. (4 papers). Explosion-protected design of electrical equipment. (2 papers). General requirements to be met by explosion-protected electrical apparatus. (9 papers). Verification and testing. Types of protection against explosion: flameproof design (type d'') (4 papers). Increased safety (typee''). (6 papers). Intrinsic safety (type i''). (5 papers). Encapsulation (typem''). (2 papers). Oil immersion (type o''). (2 papers). Sand-filling (typeq''). (2 papers). Pressurization. (3 papers). Identification of electrical apparatus protected against explosion. (2 papers). Certification of electrical equipment protected against explosion. 6. SPECIAL ELECTRICAL MINE EQUIPMENT. Mine control and monitoring devices. (9 papers). Network fault selection system. (1 paper). Earth fault selection in unearthed network systems. (2 papers). Earth fault selection in earthed network systems. Fuses and ASZK networks. Mine switching and distribution installations. (4 papers). Mine dispatch service. (5 papers). 7. MINE CABLES. Main features of mine cables. Particular cable requirements for use in mines. Standard design cables suitable for mine use. Standard flexible cables for mine applications. Special cables for low-voltage gassy mines networks. Special high-voltage cables for gassy mines. Opencast mine cables. Signal and telephone cables. Cable-laying in underground mines. Cable faults and consequences. (2 papers). Monitoring of the integrity of earthing through flexible cables and cable damage. References. Subject Index. Both mining and electrical engineers need to bear in mind the following specific requirements of electrical applications in mining. 1) Economy of electrical plant and equipment in relation to the cost price of the extracted mineral ores, governed by the specific exploitation conditions, 2) Reliability of electrical plant and equipment for extractive operations, operational efficiency, and plant and personnel safety. 3) Special safeguards to counteract the additional hazards posed by the use of electric power, and by electrical phenomena in general. 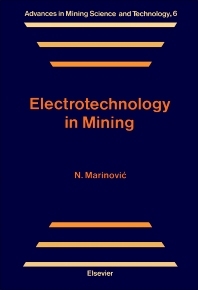 The book has been written along these lines, dealing with those topics which highlight the aspects of electrical engineering of relevance for mining engineers and aspects of mining operations that electrical engineers need, to meet the above-mentioned basic requirements governing the introduction and use of electrical plants and systems in mines. This book is intended as a text book and will be of use to students, and colleges as well as to mining and electrical engineers.